Roscommon players show their disappointment in the dressing room. IN THE FINAL installment of AIB’s “Behind The Gates” documentary, viewers are reminded of the final leg of Roscommon’s 2017 championship, which finished at the All-Ireland quarter-final stage. After producing a shock victory against Galway in the Connacht final, they were paired with another provincial rival in the quarter-final — Mayo. The documentary shows manager Kevin McStay prepare his charges for the crunch tie against his native county, and a distinct sense of optimism is evident among the players in the build-up. The first clash between the sides ended in a draw on a miserable day in July, courtesy of a Donie Smith free from an acute angle in the 74th minute. Despite the pressurised situation, Smith gives a composed interview in the dressing room shortly after the game. And although the Rossies seem positive as they go about preparing for the replay, Mayo produce a much stronger performance in the second game to comfortably win by 4-19 0-09. The sense of disappointment in the Roscommon dressing room after the final whistle illustrates how much representing their county means to the players. Take a look at the final episode in full here. 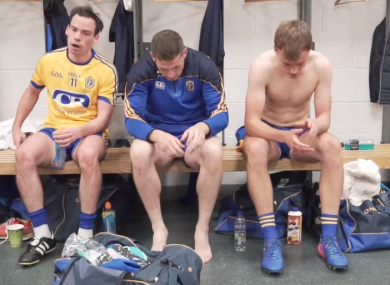 Email “Watch: The dejected Roscommon dressing room after suffering All-Ireland quarter-final defeat ”. Feedback on “Watch: The dejected Roscommon dressing room after suffering All-Ireland quarter-final defeat ”.